Net So! So What? Sessionz. next to Sterland | Free from 5 - 6pm *** R30 thereafter | Cooler bags are allowed. Net So! brings you the official So wHAT? 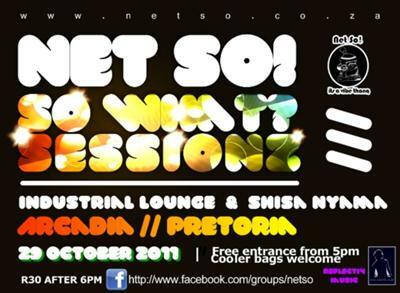 Sessionz @ Industrial lounge & ShisaNyama. Net So! is hitting the capital of house music with this big summer sizzler. We really love house music, SO WHAT? Sunday 30 OCT //// we at ENNERDALE | EXT5 | Lazuret Park for the Net So!